Whether you believe flat design is the right design for e-learning or that it’s another passing design trend, there’s a great deal of interest in DIY e-learning graphics. If you’re a course designer who wants to build custom graphics, the flat style could be a perfect fit. 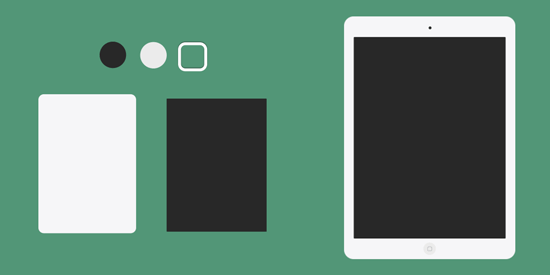 Flat design emphasizes simplicity over realism. 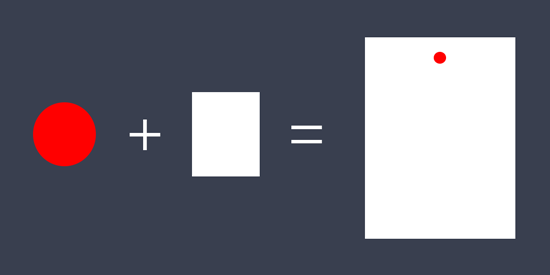 That means you don’t need mad illustration skills to create custom course elements. Using simple shapes and color palettes, you can easily create custom e-learning graphics without impacting production times. Last week Tom shared a free learning interaction, template, and assets. After seeing the template and peeking at the graphics he built, I knew this would make a really fun e-learning challenge. If you don’t see yourself as a graphics guru, take a minute to download the Storyline, PowerPoint, and editable assets Tom created. Ungroup the objects (Right-click > Ungroup) and you’ll discover just how quickly you can build graphics using the flat design style. Everything was created using basic shapes in PowerPoint and Storyline. The minimalist style isn't just for office graphics. The design style can also be used to create e-learning characters. Using a limited color palette and basic shapes, Mike Taylor created a series of construction characters and equipment. If you’re a one-person e-learning team with no budget and limited graphics skills, flat design is worth considering. And that’s what this week’s e-learning challenge is all about! This week your challenge is to design an office or desktop theme based on your own workplace environment. Design as many objects as you like. For variety, try adding both top and front views of your workspace. 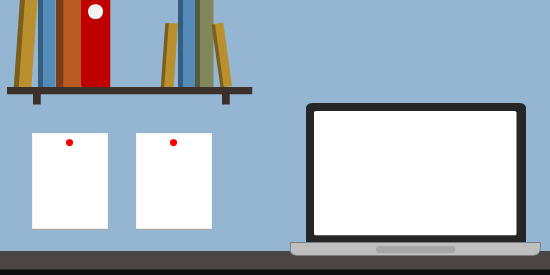 Extra credit: Share a photo of your office workspace so we can compare it with your flat design template. You can use Storyline, PowerPoint, or any other graphics program to create your flat desktop templates. Here are some free flat design templates for PowerPoint and Storyline to get your creative juices flowing. Facebook: Reply to this Facebook post with a link to your webcam video. Before you go flat out crazy, take a look at the creative webcam videos you and your fellow community members shared in last week’s video challenge. 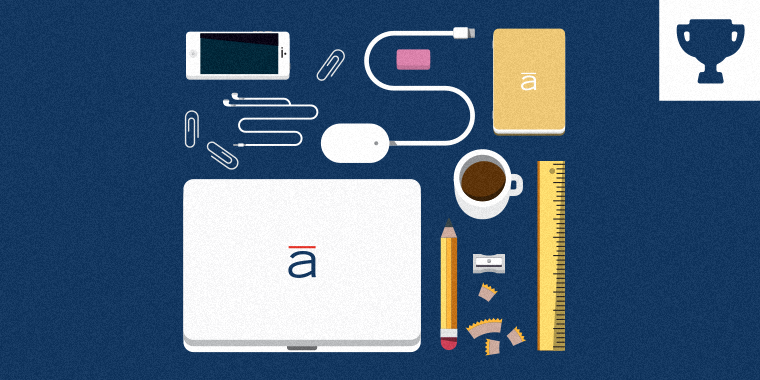 Wishing you a flat-tastic week, E-Learning Heroes! Even if you’re using a trial version of Studio ’13 or Storyline, you can absolutely publish your challenge files. Just sign up for a fully functional, free trial, and have at it. And remember to post your questions and comments in the forums; we're here to help. This looks like fun. Something tells me a few four-legged office accessories could potentially show up. Tip for the non designers... just find some cool looking pictures and sketch them on a piece of paper to get the basic shapes! I absolutely love flat graphics, makes me want to go back and re-do all of my modules since 2002. Here is my entry with a few indulgences. :) http://genahocson.com/2014/09/14/the-world-is-flat-elearning-challenge-50-flat-design-graphics-for-elearning/ This was so much fun to do! Well done Gemma! Love the flat storyline interface. simplify* awesome Sunday spelling. I am using Illustrator for mine. I hope it doesn't look weird. Gena - Well done, especially the boots....the desk looks like a great place to hide them ;) Thanks for sharing and keeping the feature request for SL-Mac alive. @Jeff: Nice! Like the family photo and the wide view. Can't wait to see the finished version! @Paul: Good referral to flaticon.com - I've used them to nice effect, too. @Gena: Great job! Thanks for explaining how you did it on your blog post, too. I'm right in the middle of completely switching up my workspace and going to a new layout and a stand/sit/walk desk (SO excited!!) - so I'll be capturing the projected end result for this challenge and will share the photo finish once it's complete. Love the challenge, by the way. I constructed a couple of very simple flat images in PowerPoint (coffee cup, pencil) for Challenge #4 and was shocked at how easy and fun it was to create them. Looking forward to your entry Jackie. Creating flat design graphics indeed is ridiculously easy and soooooOO much fun to do. I'd like to extend the challenge beyond the desktop and ask for those interested to also create a different environment. This could be themed e.g. hospital, army, office, store or just something you feel that might be useful to others. That way we could really create a nice package! This one if right up my ally. I hope I have time to do it since I am technically on vacation and am supposed to be staying away from my computer. So far I am failing. Gena from looking at your site I knew you would love doing this one and the results are awesome. I love how you worked the boots into the pic. @Cary - I'm repeatedly clicking on the Enterprise and Tardis, much fun! Jeff your design is looking great. I love the picture of your family but I think something is missing. Are you going to add in the laundry?